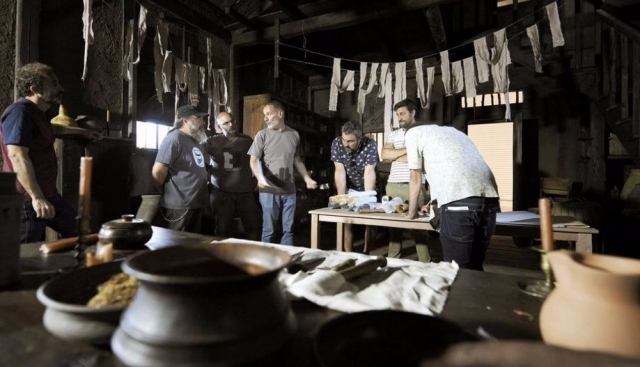 All lovers of good TV series and the history of Galicia, must be very attentive to 'El final del camino', a series with great production values by Voz Audiovisual for TVE and TVG, with an extension of eight chapters. Scheduled for being broadcasted in those Spanish channels for prime time, the series will run in a historical enclave of unsurpassed importance which lovers of the Camino de Santiago certainly will be interested. 'El final del camino' will run at the time of the construction of the Cathedral, from 1075-1120; a time when other important events happened as the struggles between the Christian kingdoms, conflicts with muslims and the Almoravids invasions. The level of recreation that will show the series will be faithful to the historical records remaining, adviced by historians and experts in archeology. The challenge for the producer is making a TV series which takes places in a time in history we have seen very little in films or television and we hardly know details.The epicenter is the Cathedral of Santiago, seeing the different stages of construction from the foundation. However, the city of Santiago in the XI century will not be the only scenario of this historical adventure drama. We will see recreated a village with houses made of adobe and wood, and interior sets located in Silleda where we will see a tavern at the time, the sanatorium compostelano, the Almoravid hall of the throne in Seville, the palace of Toledo and the house of one of the characters. All these scenarios, faithfully recreated, will give life to a TV series where the action won't miss: we can expect great battles, gallops on horseback, landings and impressive assaults of castles, played by twenty specialists by episodes and hundreds of extras. 'El final del camino' will be the best way to meet and see how Galicia was the eleventh century. Pues no conocía la serie. Habrá que verla. Si es la mitad de entretenida que Aguila Roja, me la veré. A ver cómo de bien están los protas, porque lo que es rigor historico, parece que va sobrada.